With so many great restaurants in Budapest, deciding where to eat can be a daunting task, especially if you’re only in town for a few days. I’ve asked a few of my blogger friends to help me list the best Budapest restaurants for you. From the best place in town to find authentic Hungarian dishes, to vegan food, to the best burger — this list has you covered! This was my favorite restaurant during my time in Budapest. It’s also the first one I send friends to when I learn they plan to visit the city. The menu is not extensive, but it does contain enough interesting options to convince you to return before you’ve even ordered your first dish. 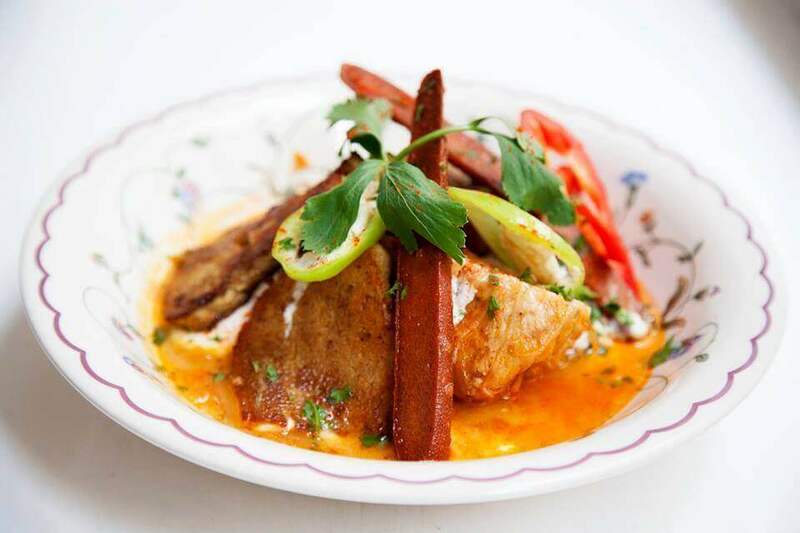 It’s hard to decide on just one dish with options like duck salad, roasted pork tenderloin, filet mignon, and traditional Hungarian dishes as well. This place is so good I went thee times during my visit! It’s best to call ahead, as the restaurant isn’t large even though it’s quite popular. Getting a table can be difficult. 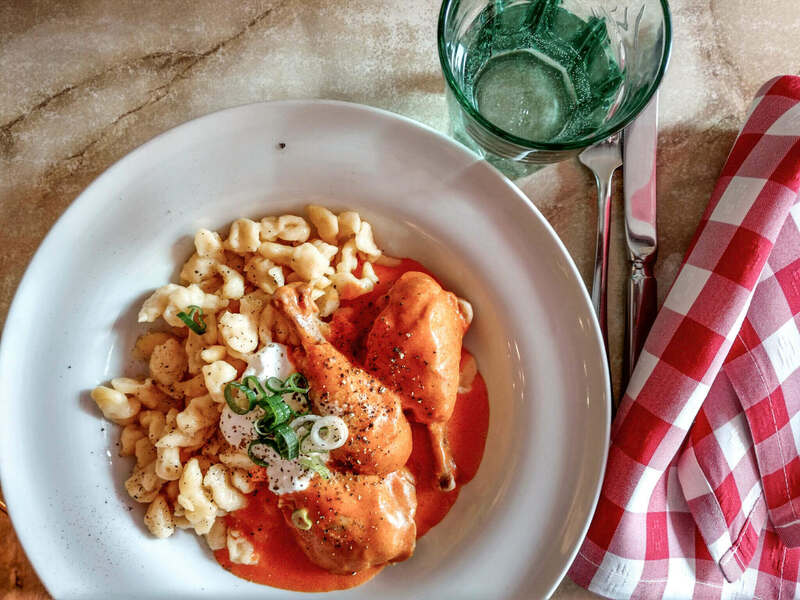 Located at the heart of the Castle complex, the Pest Buda Bistro is a great spot to try one of Hungary’s most iconic dishes: chicken paprikash with buttered noodles. Tender, juicy chicken is smothered in a creamy paprika sauce. Together with the home-made Spätzle, this is a dish you will be dreaming about after you leave. Pest Buda Bistro’s decor is like a modern Hungarian Farmhouse style — warm, cozy and inviting. They are also a boutique hotel, and their rooms are absolutely gorgeous. If you want to stay there, book your room early. Pest Buda is just steps away from the famous Fisherman’s bastion, and I highly recommend you plan your visit to Budapest’s Castle complex to allow for a lunch or dinner there. You won’t be disappointed, I promise. Bestia means “Beast” in Hungarian. Located in Central Pest next to the famous St. Stephan’s Basilica. this restaurant is the perfect place for locals and visitors to kick back, chill with a few good friends, and enjoy beer while listening to live music — all in a glowing, cozy atmosphere. Bestia’s selling points are its craft beer selection, live music, and great food. 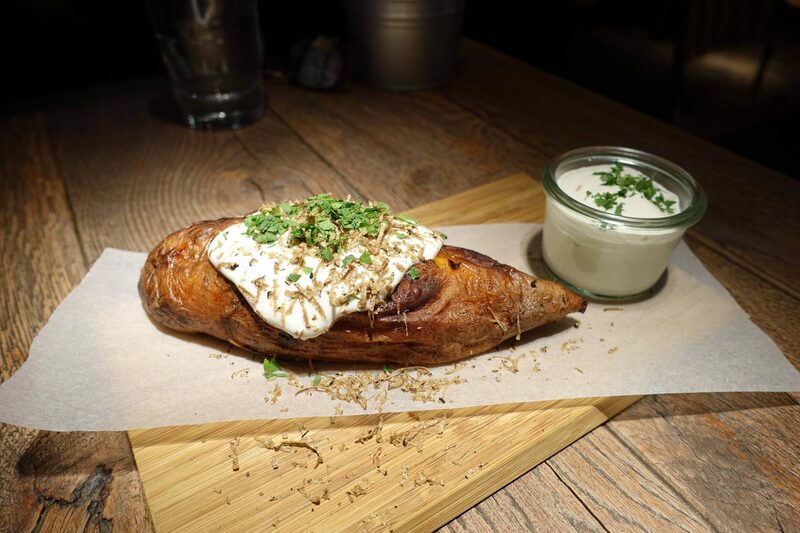 My favorite is the appetizer — sweet potato served with shaved truffles and sour cream. 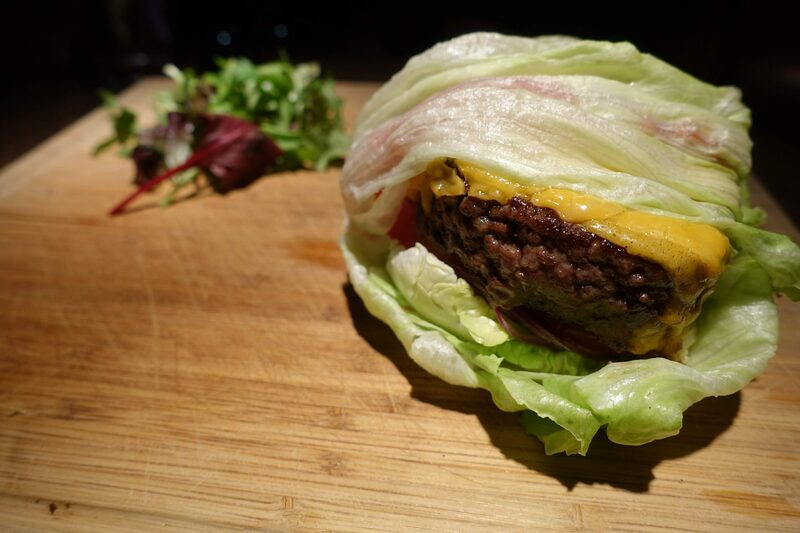 I also had the skinny Angus burger, which is served between lettuce leaves instead of buns. The best burger I’ve tasted in Europe! Bestia is also vegetarian and vegan friendly. There are many options to suit both. Bestia’s more than 30 craft beers are sourced mostly from Hungary, along with several from Central Europe. Try Mad Scientist Jam72, a unique IPA, to get started! Blue Rose is a hidden restaurant located in Budapest’s Jewish district. You can easily miss it if you don’t notice the small sign at the house. Follow the steps, and don’t be put off by the restaurant’s interior, as it’s decorated quite simply and, I guess, authentic. 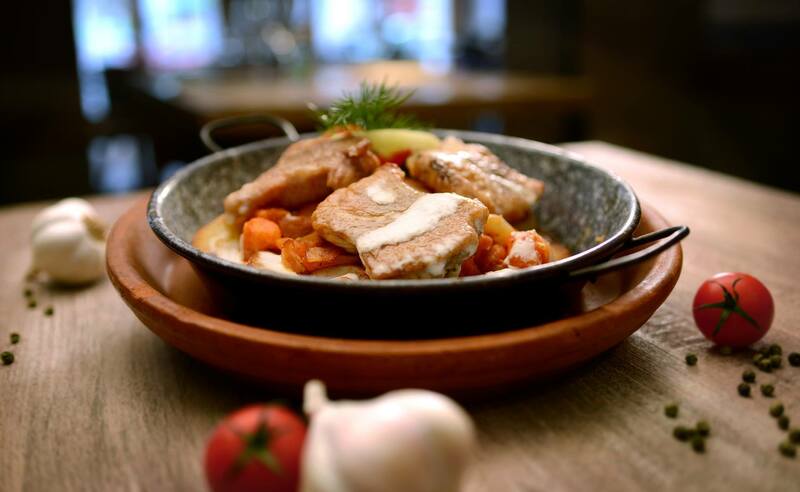 The menu is filled with traditional Hungarian dishes, and it’s super hard to choose simply one. However, after eating there a couple of days in a row, we found the perfect combination: start with home-made pickles before you fall in love with goulash and thick noodles. The goulash here tastes as though it’s been cooking for hours and hours. The meat is super soft, and the thick brown sauce is just perfectly done – just like you would it expect from a Hungarian granny who has been cooking this dish for years and years. Don’t miss out on that! In the last few years, Budapest’s street food scene has taken off, with Street Food Karavan sitting at the center of the movement. Smack dab in the center of Budapest’s party-loving 7th district and just down the street from the famous Szimpla ruin pub, Karavan was created in an outdoor parking lot that has been closed to traffic and transformed into a cool space with a beer garden vibe. Street food trucks line both sides of the lot, and you can pick up classic street eats, modern twists on Hungarian specialties, and international bites. 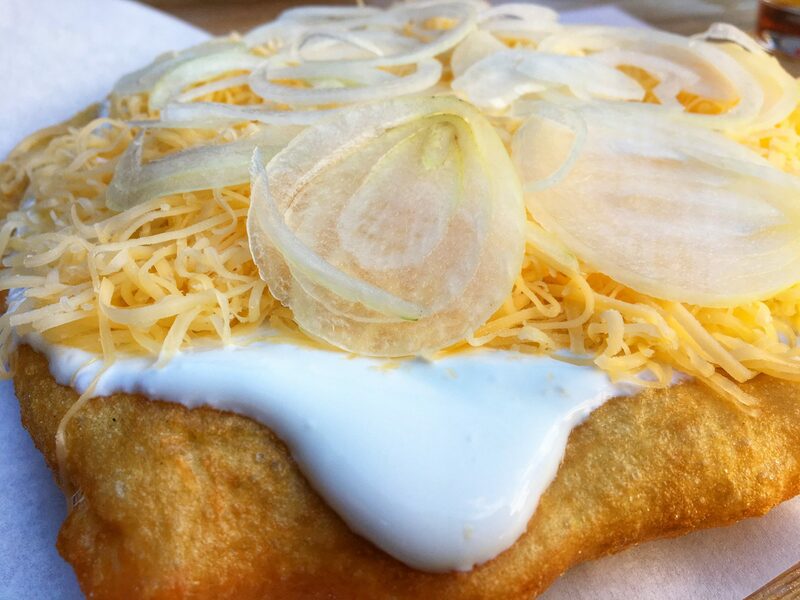 If you want something local, try the Lángos — deep-fried dough slathered in garlic, cream cheese, and shredded cheese. For something international, my favorite stop is Samurice for the teriyaki chicken rice burger. For vegetarians and vegans, there are a few options that will sate your appetite. You can also grab simple drinks, such as beer, wine, and fröccs (wine spritzer), a local favorite! The main downside of dining at Karavan is that it’s seasonal: because of Budapest’s cold winters, Karavan is closed from late fall until early spring. It usually opens up each year around the beginning of April. Looking for things to see and do while you’re in town? Check out my guide detailing the best things to do in Budapest! During one of my (predictable) cravings for Italian, I chose to visit Oinos without knowing anything about it. I went in with no expectations but left as a new fan of the bistro. The ingredients were fresh, the portions were generous, the wine list was impressive, and the staff were friendly and happy to make suggestions. 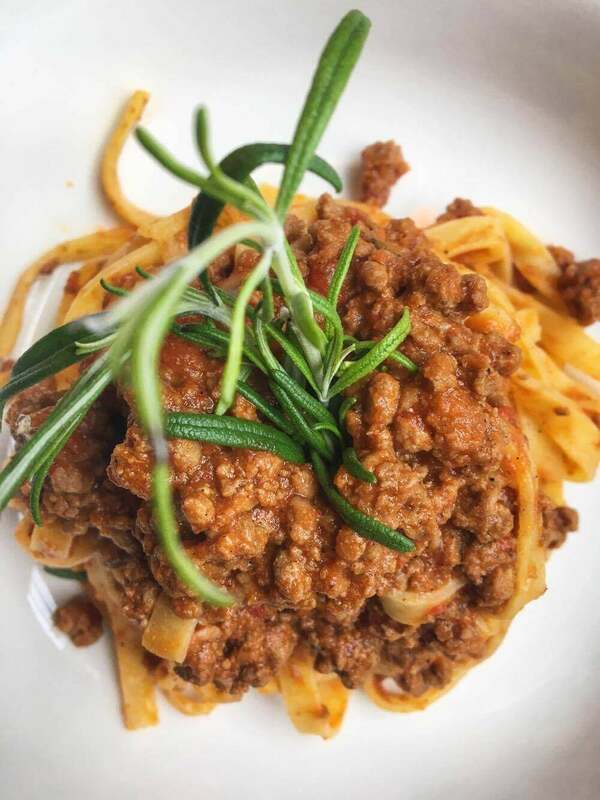 I had a classic bolognese and tried a couple different glasses of local red wines. Food, service and wine were all seriously impressive. Napfényes Étterem is without a doubt one of the best places to eat in Budapest. The food is delicious, the staff are polite (a bit of a rarity in Hungary), and the prices are cheap. It’s also one of the only places in Budapest where you can try a meal that’s both traditionally Hungarian but also vegan. We recommend the Kolozsvári Töltött Káposzta — home-made sauerkraut and stuffed cabbage leaves. Sounds kind of gross, but trust me, it’s one of the tastiest meals you’ll ever have. We’ve gently coerced many a meat-lover into this place, and all have been astounded by how much they enjoyed the food. The portions are gigantic, but they do offer take-away service. So if you’re too full to finish, just take it home with you. 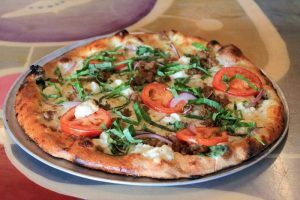 If you’re in the mood for something a little less Eastern European, they also have the best pizzas in town. After traveling through Europe for 30 days, Budapest was the final stop. The first Hungarian meal I tried was at Gettó Gulyás. As someone from New York City, I can be a little desensitized to the restaurants around the world. It takes a lot to blow me away, but this place managed to accomplish just that. As soon as you walk in, you notice the décor is modern, fresh and welcoming. The menu (written in English) is concise, clear, and made with fresh ingredients. Of the three times I dined there, my favorite dish was the beef stew in red wine reduction. The beef was tender, and the salt to sweet ratio was simply on point. The stews they offer include chicken, veal, venison and one that caught me by surprise…rooster testicles. They also have a seafood and vegetarian mushroom stew for non-meat lovers. This place is for sure a not-to-miss when eating in Budapest. 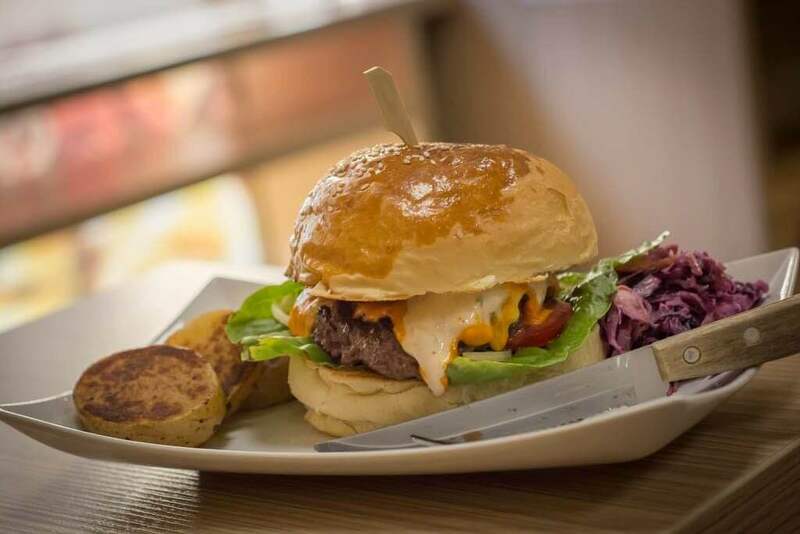 If you are heading to Budapest you might not think having a burger is a very ‘foodie’ thing to do. But, surprisingly enough, when we were there the locals kept insisting that burgers are the thing to eat in Budapest. Hesitantly, we decided to give it a try…and they are right! Budapest is seriously rockin’ out some of the best burgers we’ve ever had, in particular, the burger joint W35. Imagine homemade BBQ sauce and cheese oozing over a perfectly cooked medium rare beef patty, placed on a freshly toasted home-baked bread roll. On the side, there’s a crispy serving of duck fat fried potatoes. That’s right! Potatoes fried in duck fat. If you’ve never had potatoes fried in duck fat, you’ve never lived. To top it all off this entire meal only costs about $4 USD. For something extra dirty and tasty, we also recommend giving the jalapeno poppers a try. They are oh so naughty, but delicious. Trying local dishes is a must when I travel. As much as I love to eat street food, there’s nothing like a relaxing sit-down meal at local restaurants that serve some of the best meals in the region! Hungarikum Bistro was no exception! A cozy bistro not far from the city center and a five-minute walk from the Parliament, I smiled as I opened the menu and saw what they had to offer. Chicken paprikash, goulash, Hungarian sausages, stuffed cabbage rolls, Langos were some of the delicious items on offer. The service was swift and the staff polite. They explained the various wines available and provided suggestions. A musician played instruments while we waited for our food. The food was piping hot and delicious! The Langos was crispy and cheesy! 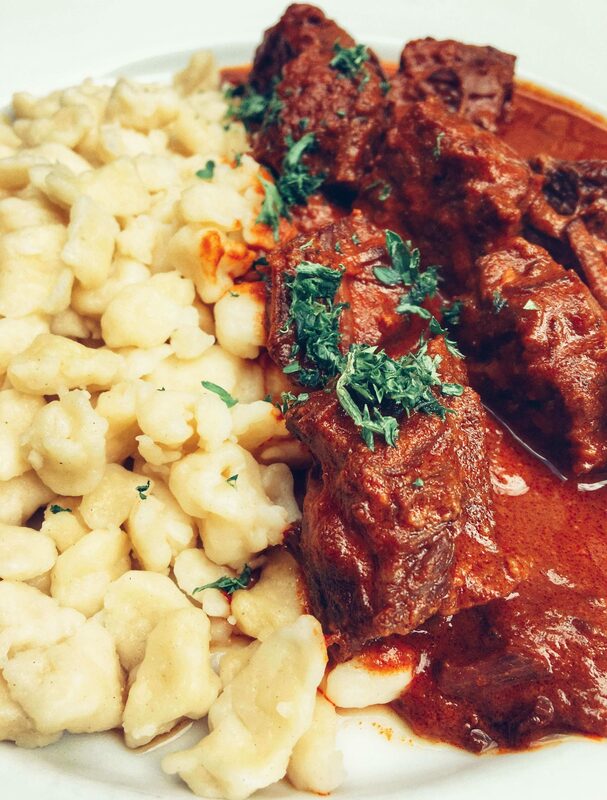 The paprikash had the right amount of spice. Even so, we were also given a paprika dip if we needed to make it spicier! It was quite a memorable dining experience at the Hungarikum Bistro, and we loved the food so much we returned thrice during our visit! Menza Étterem és Kávézó is a Hungarian restaurant with retro vibes that serves up top-notch Hungarian food. This favorite of both locals and tourists has a cozy atmosphere, a great wine selection, friendly waiters (who speak good English), and a location close to many of Budapest’s attractions. I personally loved the beef goulash, which was recommended to me by a Hungarian girl I met (who brought me to her favorite restaurant: Menza!). Vegetarians will also be able to find an option. The menu changes weekly, so be aware that they may not have a house specialty you read about online. I found Menza was one of the most careful restaurants I visited in Budapest. They catered to my issues with lactose, and I highly recommend Menza for anyone who has food allergies, as I struggled otherwise while I was in Budapest. I was very impressed with the portions, and I loved that you can have a full three-course meal for such an affordable price. This makes it perfect for groups, as their portions are large enough to share (and still have leftovers). I love finding places like Mazi — a small, cozy restaurant that’s always buzzing, as it’s one of the most popular in town. I was presented with a menu, but before I had the chance to decide, the friendly owner stopped by my table. After a short chat, I left my dinner up to his recommendations. 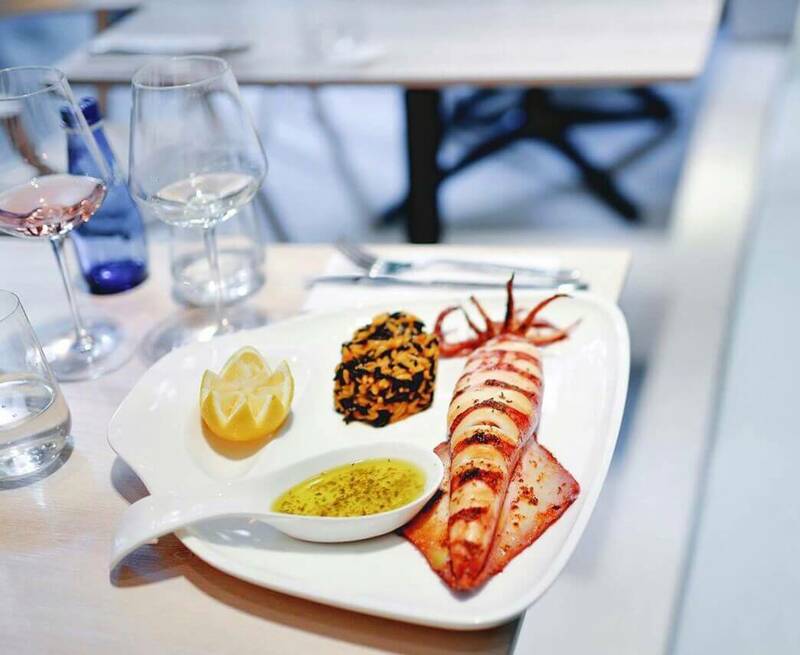 I was especially impressed with the seafood — fresh and simply but expertly prepared in classic Greek style. The wine pairings the staff suggested were also spot on. This is another restaurant that’s quite popular. You’ll want to make sure you have reservations. 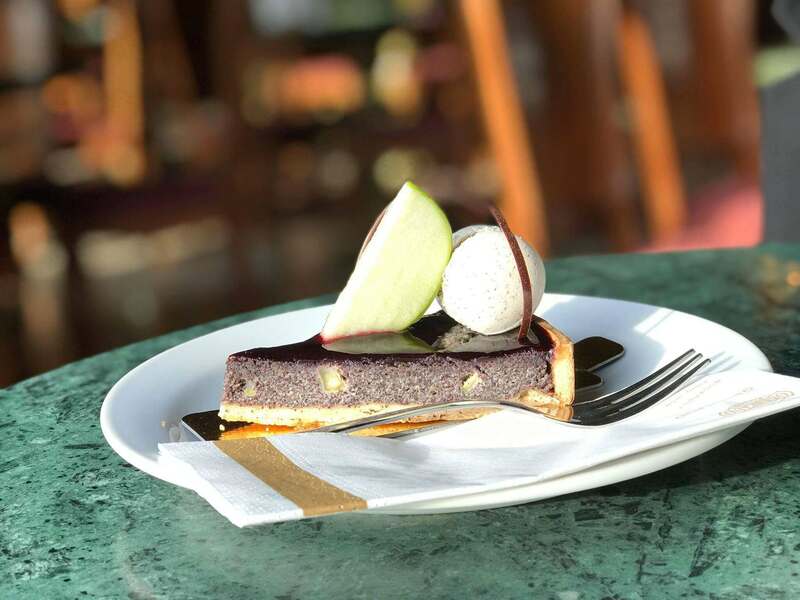 Budapest is famous for its traditional cafés and confectioneries. Some of these places have been expanded to also serve as restaurants, like the Gerbeaud Café located in Vörösmarty Square. The place opened in the mid 19th century, but it was made famous by Emil Gerbeaud, the Swiss-born Hungarian confectioner. Even if you don’t plan to eat there while you explore the highlights of Budapest, it’s worth visiting to check out the beautiful chandeliers and marble tables inside. Gerbeaud Café also has a nice terrace where you can sit outside and enjoy the summer months. Although the main attractions are still the famous cakes, such as the Dobos or signature Gerbeaud Cake, which is my favorite. Gerbeaud Café also has a nice bistro area where they serve tasty goulash soup and other Hungarian specialties from stuffed cabbage to different stews. You can also order more international dishes — from burgers to pasta. Which of these Budapest restaurants do you most want to try? Let me know in the comments section below! Wow, this article was making me hungry. 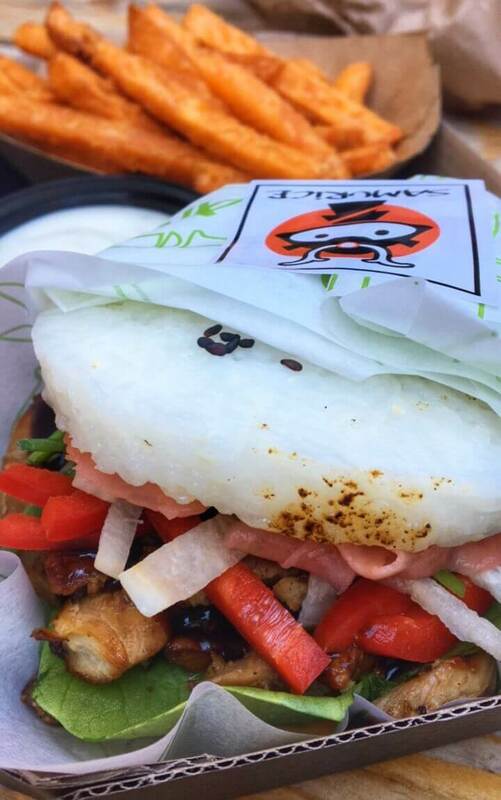 Everything looks delicious and even the street food looks super fresh and yummy. I love seafood so the dish with the squid looks amazing. That seafood dish was amazing. They do it Greek style- simple but perfect! Yum, Budapest is on my bucket list and I have been wondering about the food there. It all looks so good. Thanks, now I know what to expect! It’s great because it’s such an international city you really can find any kind of food you want! I really love their local dishes. Spätzle. Definitely want Spätzle. It’s not something we have very often, and I would have no idea how to make it at home. I love it so much also! It’s a perfect base for saucy dishes. Fantastic suggestions! My mouth is watering at all the delicious looking foods. I will make sure to keep these suggestions in mind when I someday visit Budapest! I hope you are able to go soon, it really is an amazing city! Some really nice choices here! There’s a langos truck here in NYC, but haven’t tried it yet. 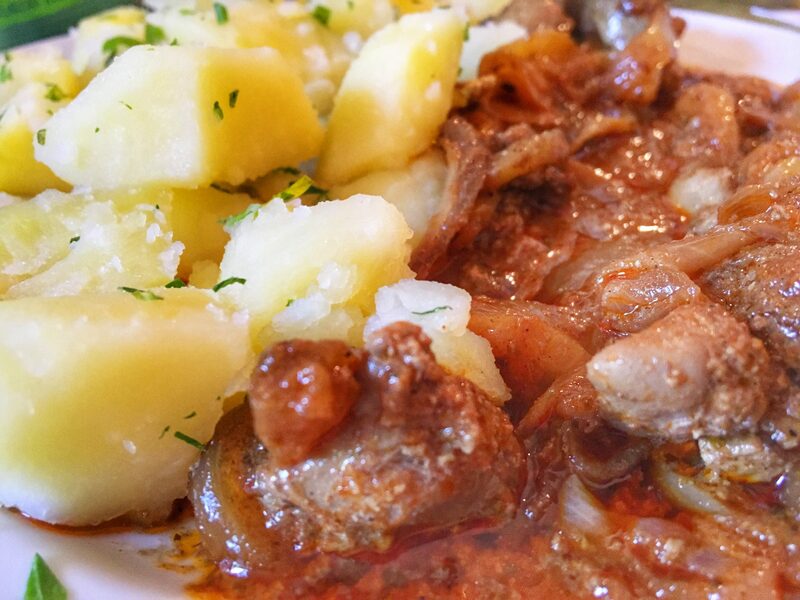 Menza looks like a good spot for local food and Gettó Gulyás caught our attention for venison and rooster testicles. Blue Rose sounds like our kind of spot – hidden, low key and traditional food. Would you try the rooster testicles? I think I would just to say I did! 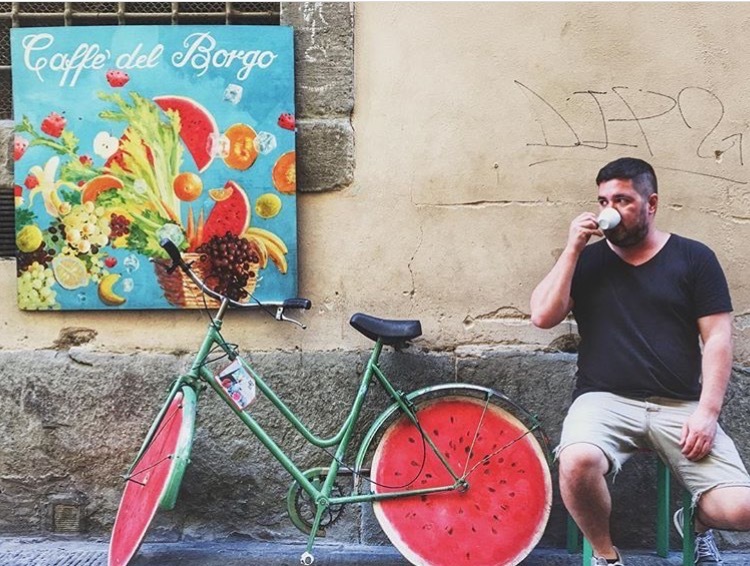 What an exstensive post on Budapest food scene- I’m so saving this for next time I’m in Budapest. I’ve been there as a teenager, and I feel like a lot has changed food-wise. From reading all this blog posts, it seems like it turned into a real food capital. I’m craving those langos! Langos may be the dish I crave the most from my time there. It’s definitely not healthy but it’s delicious! That’s sad you didn’t enjoy it as much as my contributor did! Hopefully people searching for vegan options will scroll through the comments and see both suggestions so they can compare the two. I hope you make it to Budapest soon! It’s a gorgeous city full of amazing food and history. This is not helping my healthy eating at all! Yay!! Then it’s working lol. A healthy eating blog this is not! We had a wonderful meal at Pest-Buda. Bistro. Come sez Choi was by far the best meal of our two week Central Europe vacation. Ruszwurm cafe…I still dream about their Dobos torte! Yummy….. 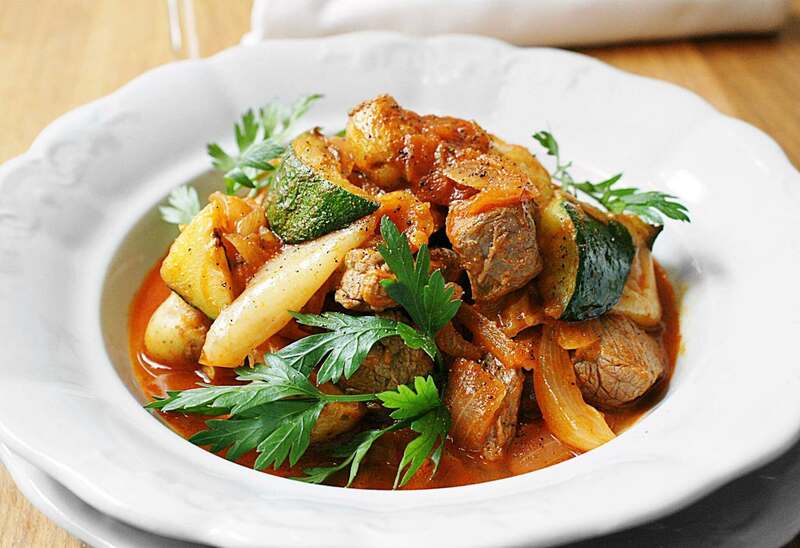 These dishes looks delicious….. Budapest is in my list… This article is very useful for me …. Thanks for sharing.